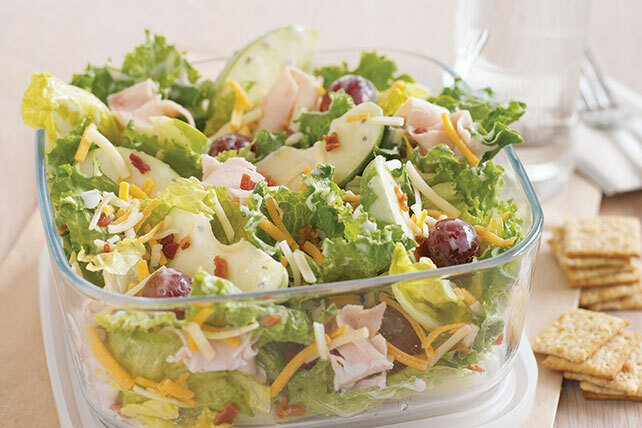 Be aware when packing this sweet salad made with apples, grapes, bacon and turkey that your lunch might make your coworkers envious! Place apples in resealable container. Add dressing; seal container. Toss to evenly coat apples with dressing. Top with layers of remaining ingredients; seal container. Refrigerate until ready to pack in an insulated lunch bag and head out the door. Serve with 16 thin wheat snack crackers. Prepare as directed, using one of the following flavor options: Beef 'N Cheddar Toss: Substitute 1/2 cup tomato wedges and 1 red onion ring for the apples and grapes, and OSCAR MAYER Deli Fresh Roast Beef for the turkey. Easy Chef Salad: Use KRAFT Lite Zesty Italian Dressing, and substitute 1/2 cup tomato wedges and 1/4 cup sliced cucumbers for the apples and grapes. Ham & Cranberry Pear Salad: Use KRAFT Balsamic Vinaigrette Dressing, and substitute 1/2 cup pear wedges and 1/4 cup dried cranberries for the apples and grapes, and OSCAR MAYER Smoked Ham for the turkey.